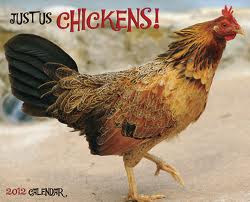 The title of this blog comes from a calendar I bought a few years ago entitled, "Just Us Chickens." This calendar featured 12 glossy pictures of our fabulously feathered friend, the chicken. My husband was less than thrilled when I brought it home, claiming that it was more junk that I didn't need. While that was probably true, I love chickens (although I don't know why) and I picked it up during an after Christmas sale for only a few bucks. I was also unable to pass up a book titled Exquisite Chickens, which I found in the bargain bin of Barnes and Noble. Given my chicken "fetish" I couldn't resist the new chicken themed items featured this fall at J. Crew. Plus these chickens are apparently French (notice the beret) so that makes them all the more irresistible! 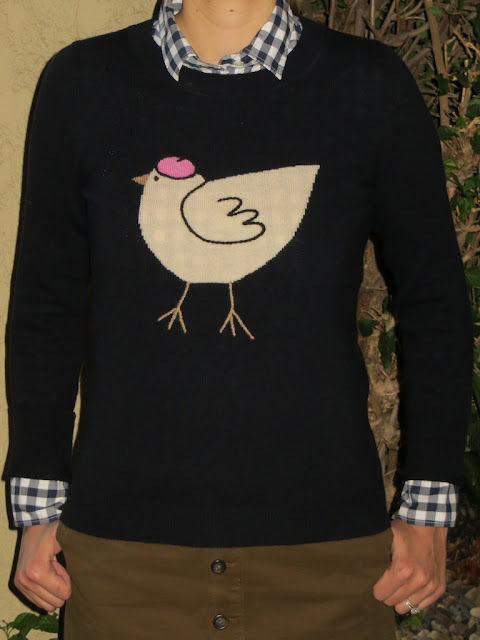 I was so enamored with this French chicken motif that I purchased both the French Hen sweater and the silk Boy Shirt in the same print at full price. Well, not quite full price, as I used one of the 25% off your total purchase of $150 promo from last month to purchase both. I like to get a good deal on my chickens! 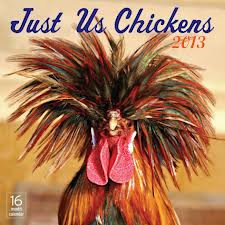 Here are some covers of the calendars produced by the "Just Us Chickens" people. As you can see there is one for 2013, which you may want to add to your Christmas wish list. I know I'll be asking Santa for it this year! omg, this outfit is so cute - and i love the history behind getting it! Thank you Laura! Yes, I guess there is usually a "history" behind a lot of the stuff I buy!